Osteo Bi-Flex Triple Strength is a joint health supplement based on glucosamine, chondroitin, and methylsufonylmethane (MSM), as the most important ingredients. These three compounds are known to promote joint function and to help relieve pain when they are aching. Unfortunately, as we age, we lose some of the cartilage sustaining the joints and their flexibility, and the liquid between them is also affected. Osteo Bi-Flex Triple Strength seems to have all the necessary ingredients for a good product, so you can enjoy a life without constant joint pains. Let’s see together if this supplement is the most reliable you can find. What Does Osteo Bi-Flex Triple Strength Contain? It is good to see that so many potent ingredients are included in this formula. Chondroitin, together with MSM and glucosamine make a powerful combination, and they support the joint function, while reducing pain and improving the quality of the synovial liquid. Also, the herbal extracts and the hyaluronic acid bring their contribution. All in all, this sounds like a great product. According to the label, you need to take two tablets daily, to see the best results. The manufacturer also recommends taking the supplement regularly. 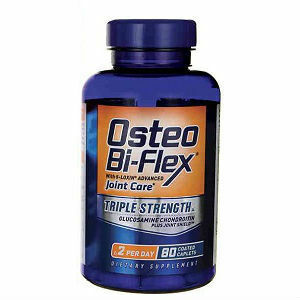 The listing price for Osteo Bi-Flex Triple Strength is 41.65USD for a bottle with 120 capsules. This sounds like a good deal, since one bottle lasts for two months. There is no clear guarantee offered on the manufacturer’s website, so you may have to ask for a refund to a reseller, depending on their policy. It is good to have glucosamine, chondroitin and MSM in the same formula for best effects for your joints. Also, hyaluronic acid and herbal extracts make for fine additions, which is why we appreciate Osteo Bi-Flex Triple Strength as being a good, reliable product. There are plenty of positive reviews from users, as well, so, the bottom line is that this particular joint health supplement is worth spending money on. Mark Stevens	reviewed Osteo Bi-Flex	on October 10th	 and gave it a rating of 2.5.